Photographs of Aquatic Plants Restoration in Lake Nojiri. Lake Nojiri had been famous for rich aquatic plants until 1970's. In the early 20th century, more than twenty of plant species were recorded during the ecological research on distribution and structure of aquatic plants in the lake. However, in 1978, five thousands grass carps were introduced in order to manage the aquatic plants, which sometimes interfere of the fishery and boat navigation. Three years after its introduction, most of aquatic plants including genus Nitellopsis obtusa (stonewort) were heavily damaged or extinct due to overgrazing by grass carps. 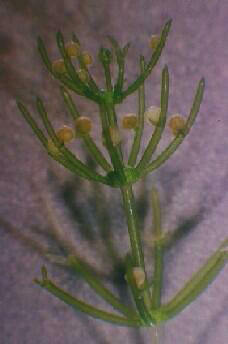 Nitellopsis obtusa is now extinct in the wild in Japan, but living cultures of N.obtusa originating from Lake Nojiri has been preserved in the laboratory of Osaka Medical University. This information initiated activity for restoration in Lake Nojiri by Nagano Research Institute for Health and Pollution(NRIHP). In 1996, NRIHP activity for restoration had started with Nojiri-ko Museum, and local voluntary staffs. First project was to install experimental exclosures. Photographs of the Aquatic Plants Restoration zone. They are in front of the Hotel Fuyosou.